I was searching today for a new 24V transformer, and I found that some of them have a "fuse" symbol on their label, and I was wondering what this fuse symbol means? Does the fuse symbol on a transformer (toroidal or not) mean that the fuse is integrated in the transformer's winding? Or does the "fuse" symbol try to suggest what kind of fuse has to be used with that transformer? In this case the fuse symbol indicates the fuse rating you should use. 2.40AT means you should use a 2.40A slow acting fuse (type T, T stands for Trage). Trage can be translated from German to sluggish, slow-moving. You can verify that the 2.40A matches the rated current for each secondary of the device you are considering. The datasheet mentions no fuse, so it should not be integrated. Not the answer you're looking for? Browse other questions tagged transformer power-electronics mains or ask your own question. 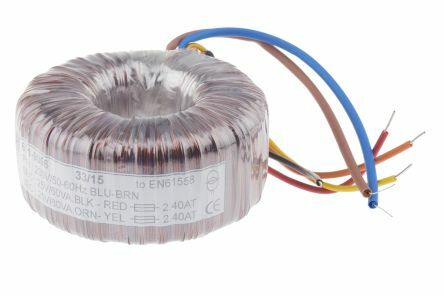 If a transformer's thermal fuse is blown, would it show Open Circuit? Can I use a dual primary transformer to generate isolated 110v output?